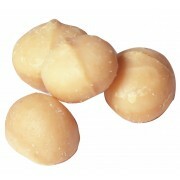 The macadamia nut was originally found in Australia. it later was transported to Hawaii where the growing conditions are ideal. In the 1990's the World Bank decided that the coffee crop and the macadamia crop had similar growing conditions. So they required farmers to plant 1 macadamia tree for every 10 coffee trees on their land. Several decades later you will find macadamia nuts in almost all the coffee growing countries of the world. 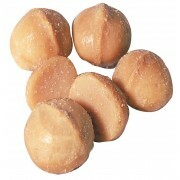 The macadamia nut crop is always small and in strong demand. Most of the crop is in the hands of mega corporations that add a chocolate coating and sell them as a finished, boxed chocolate macadamia nut..